Group therapy or counseling sessions are another type of program that has been offered to incarcerated fathers (Jeffries et al., 2001; Magaletta & Herbst, 2001). The goal of these programs is often to empower fathers to improve their parenting attitudes and behaviors to prevent violence and enhance relationships (Jeffries et al., 2001). The Helping Offenders Pursue Excellence (HOPE) for Life program pairs fathers with juvenile offenders, so each can understand the other’s perspective, and involves the fathers’ family members in therapy when possible (Magaletta & Herbst, 2001). Clinicians suggest that group therapy sessions provide a solution to the problem of social alienation; allow fathers to access one another as resources; and help fathers learn that being available to their children while in prison, even if they cannot do things for them, is positive fathering (Magaletta & Herbst, 2001). 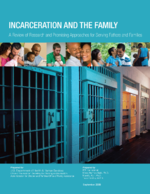 Unfortunately, research has not been conducted to evaluate the effects of group therapy approaches with incarcerated fathers on parent-child relationships and post-release success.